Indeed, cats may seem to project that impression of independence and sophistication, apparently having a mind of their own. They think that unlike dogs, cats seem so conceited that it they may not take commands easily. These assumptions were even made worse by people who said that they had attempted to train cats and everything was just a mess. The phrase “fighting like cats and dogs” didn’t come up as someone’s idea of a joke just for cartoons (Tom and Jerry comes into mind). Dogs are often territorial and will fight not just new cats but other new dogs as well. They tend to mark their territory and will fight anyone who invades their space. Cats have the same tendencies and even if they are smaller than to dogs, they will scratch and fight for their territory. Most pet lovers who have both a cat and dog have a hard time making their pets coexist with each other. The usual response to this is separating the two pets and making sure they won’t meet. This is not really a practical solution to this problem as both pets tend to wander around the house and there will come a time when they will meet. This will also cause a lot of wasted time if you have to allot twice the time for playing with your pets. Another response would be to cage both pets but this method is frowned upon by most pet lovers. The best thing to do is to train both cat and dog to coexist peacefully. 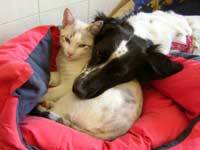 In this article is a series of steps to finding harmony between cats and dogs. Perhaps the hardest thing for pet lovers to do is the introduction. Introducing a new pet requires both time and patience as both cats and dogs requires time to adjust to something new. Both cats and dogs take up to 30 days to adjust. It is even longer if you have older pet, but with proper retraining you can teach your old dogs and cat’s new tricks. The first step is obedience. This is necessary especially for the dog which is usually the aggressor in this kind of situation. You have to train your dog to obey when you say “no”. This can be done by showing him some treat and every time he looks at it you say “no” you stop him from eating it. Do this every day and reward him every time he obeys. While doing this with your dog, make sure the cat and dog are isolated from each other, allowing your cat to wander around the house. Cats love to roam and this will make her scent scattered in your home. After doing this, lock your cat in one room and let your dog wander around the house sniffing for the cat’s scent. This will make your dog acquainted to your cats smell and train the dog that the cat is part of the household. Once you’ve done this for about a week, it’s time for them to see each other physically. This part requires that you have someone to help you. Have someone who can hold your cat safely and that knows how to react quickly and get your cat to safety if the dog is showing aggressiveness. Your part is to be able to restrain your dog and making sure that if he starts lunging for your cat, you’ll be there to stop him. Dogs usually start barking whenever they see some other animals in their territory, hoping to scare them away. They won’t really lunge at something immediately. Once he starts barking, this is where the obedience part starts to come in. Say “no” and make him realize that the cat is also a pet. If your dog starts to calm down when in the presence of the cat, then it’s the time to let him sniff the cat. Once your dog starts to decide not to bark at your cat you know that you’ve done the introduction part successfully. The final step is making sure that both pets have the time to coexist. This part is usually the cat’s fault. Cats have the tendency to be aloof and stay away from the dog and other people. It’s not because they are afraid of the dog but more because it’s their nature to be alone. Be sure that your dog sees your cat as often as possible. You can allot some time nightly where you can do some activities with both your cat and dog. This will allow them to play with each other and you’ll have the confidence that they won’t start fighting when they’re unsupervised.